Regulator Marine unveiled its 2017 fleet on the opening day of the Regulator Dealer Week event in Virginia Beach. The new Regulator 31 and newly enhanced Regulator 25 lead the model year launch, with every model in the company’s full line of center consoles delivering updates. The new 31-foot Regulator is equipped with twin 300 Yamaha engines, a large cockpit, tackle center and fishbox. Taking a cue from the Regulator 41, the new 31 will also feature a starboard dive door and integrated forward seat backrests. The Regulator 25 has been enhanced with new features including a new walkthrough tuna door, T-Top with Surfboard Edge and SeaStar Optimus Electronic Power Steering with tilt helm. Options for the 2017 lineup include SeaStar Solutions Electronic Power Steering, which is available for all models except the 41, and T-Top with Surfboard Edge, which is a new option for the 23 and the 25. 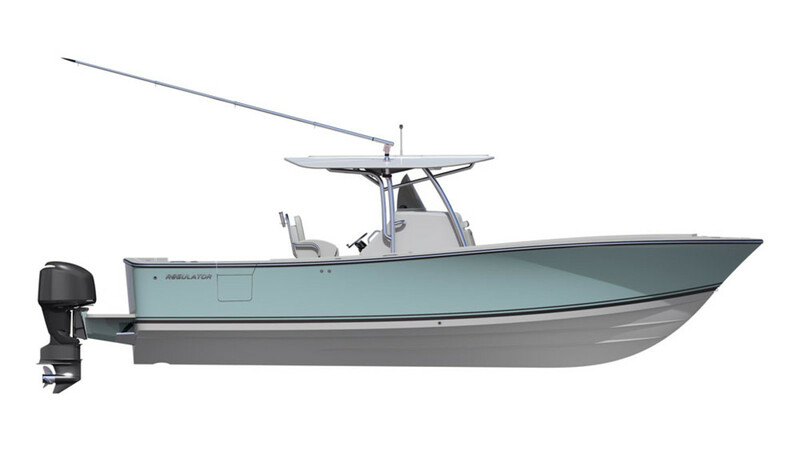 Options also include custom-painted engines, new Garmin electronics packages, updated seating/tackle/livewell options, and new gelcoat and striping colors on all models. Regulator Marine will showcase the 2017 model-year lineup at fall boat shows, starting with the North American Demo Boat Show in Cedar Point, in Sandusky, Ohio.